Rugby World Cup Sevens 2009 will be a landmark event in the history of the Women's Game. Not only will the ground-breaking tournament feature the inaugural 16-team women's competition, but for the first time the IRB has announced the selection of four of the world's top female referees amongst the 18-strong panel set for Rugby Sevens' showpiece tournament in Dubai from March 5-7. Clare Daniels (England), Joyce Henry (Canada), Gabriel Lee Wing-yi (Hong Kong) and Dana Teagarden (USA) are included within a selection that features a blend of experienced regulars from the IRB Sevens World Series circuit and some of the best up and coming match officials in world Rugby. In total 16 nationalities are represented within the panel that will preside over the 57 men's and 41 women's matches. A further 16 dedicated assistant referees and in-goal assistants have also been selected with Anastassiya Khamova, a member of the Kazakhstan Women's Sevens team who narrowly failed to qualify for Rugby World Cup Sevens 2009 and a leading referee in her country, among them. "The panel contains a balanced mix of leading international referees, those who have proven themselves on the IRB Sevens World Series circuit, excellent up and coming prospects, and for the first time, the top female referees," said IRB Referee Manager Paddy O'Brien. "The four female referees appointed to the tournament will take charge of matches in the Women's Rugby World Cup Sevens competition, which runs alongside the men's. It is a great opportunity for referees who have proven themselves on the Women's international scene to showcase their talent on Rugby Sevens' biggest global stage." 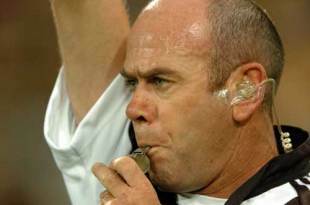 "The IRB Sevens circuit has proven to be a breeding ground for match official talent over the past decade with many of the world's top referees having graduated through the Series. It is the perfect platform for a referee to develop, providing exposure to a high-intensity, high-paced environment that tests both physical and mental skills," added O'Brien.